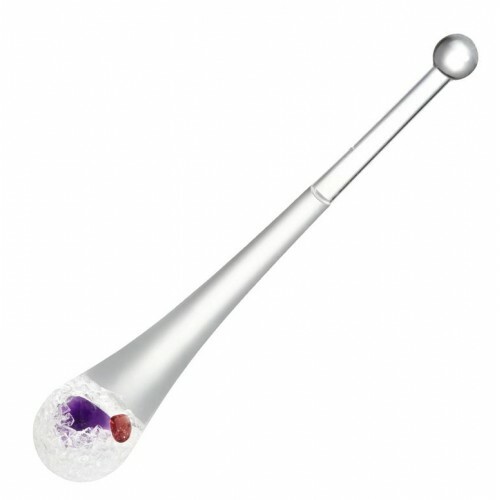 …with crystal quartz granules, a fiery garnet and an exquisite amethyst. Featuring an elegant water drop design, the Phiolino commands attention as you enjoy the convenience of gemwater at your favorite restaurant or while visiting with friends and family in their homes. Amethyst: Alertness, awareness, justice, clarification & inner peace. Supports the nerves, lungs, skin and intestinal tract. Lowers blood pressure. Garnet: Willpower, courage, good quality of life. Encourages sexuality, potency, muscular strength, metabolism, circulation and the quality of the blood. Strengthens the immune system. Clear Quartz: is known as the "master healer" and will amplify energy and thought, as well as the effect of other crystals. VitaJuwel - Kuwait © 2019 All Rights Reserved.